Whenever I see a new book about Kyoto, I tend not to pay attention. As if world-famous Kyoto needs another book for PR. There’s no shortage of books about Kyoto. And most of those books are rather clichéd. The book cover often has an image of Fushimi Inari Shrine’s torii tunnel or Ryoanji’s Rock Garden, or Kinkakuji Gold Pavilion. It seems that these people never thought of looking at what’s out there before deciding on a cover image. So it was a delightful surprise to see Kyoto: The Forest Within the Gate, a totally different kind of Kyoto book. 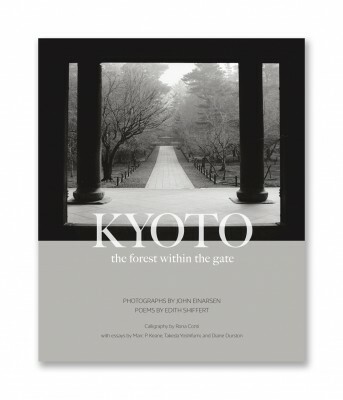 It is an excellent collaboration of fine-art B/W photographs of Kyoto by John Einarsen and English poems about Kyoto (mostly haiku) by Edith Shiffert. John is the founder of the esteemed Kyoto Journal, started in 1986. He’s also a photographer and has been creating “serene” images of Kyoto for three decades. He has been a central figure in Kyoto’s expat community for almost as long. John visited Japan for the first time in 1974 as a US Navy seaman in Yokosuka. That first visit was apparently unforgettable as he moved to Japan in 1978 and eventually settled in Kyoto by 1984. In June 2013, he was awarded the Japan Cultural Affairs Agency’s “Commissioner’s Award” for his contribution to making Japanese culture better known and understood internationally. Edith Shiffert is 97 years old and another noted and well-know expat in Kyoto. She is a published poet and translator of Japanese poems. Born in Toronto, Canada, Edith grew up in New York and lived in California and even Hawai’i during the war years. She studied poetry at the University of Washington and published her first two poetry books (one titled, For a Return to Kona) in the early 1960s. She’s been in Kyoto since the 1960s and taught at local universities. John’s 100+ photographs are impeccable. He makes Kyoto look fantastic. Making the ordinary look extraordinary. Whenever I think of Kyoto, my mind certainly doesn’t conjure up the dreamy and poetic images that you see in the book. It’s reassuring to know that such idyllic scenes and things still do exist in Kyoto, if you know where to look and how to look. Edith’s 30+ poems in the book are easy to read and understand. Straightforward and clearcut. Even kids could understand them. Most of them are short haiku (with Japanese translations) and a few are longer poems. They are mainly about Kyoto’s seasons and scenes. I’m not sure if the photos complement the poems or if the poems complement the photos. It’s probably both, and this synergy makes me see why they decided to make this book. There’s also Japanese calligraphy by Rona Conti, essays by Marc P. Keane, Diane Durston, and Takeda Yoshifumi. The initial printing was made possible by successful crowdfunding via Indiegogo. They raised more than enough money last autumn. Congratulations to John and Edith for such a great collaboration in print. The book is available at Kyoto Journal using PayPal or at Amazon.com (paperback).